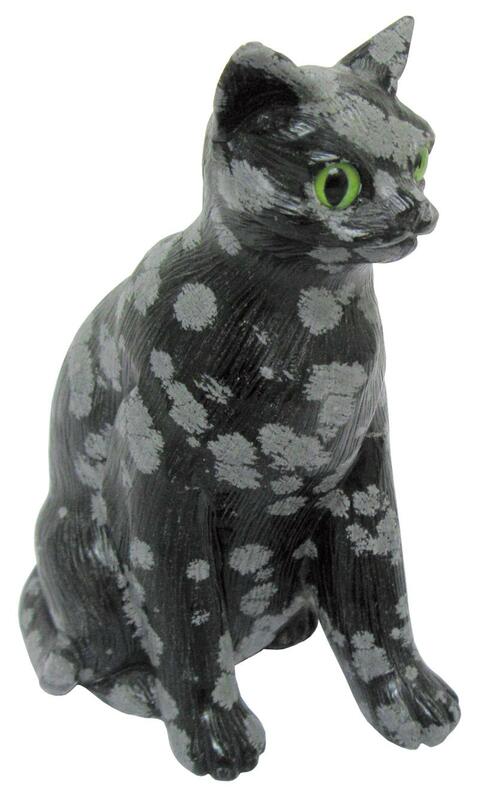 Item #GS-161: 2.5"x3"x4.5" tall, black with white flakes, Snowflake Obsidian cat. 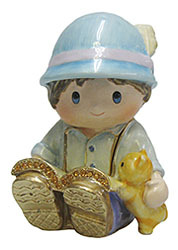 Item #IGM-12053: Approximately 2 5/8" tall, Bijorca Enameled Boy Reading with Cat Box; Magnetic lid. Item #A: 1.25"x4.75"x1.75" tall, light Green Chrysoprase Cat with slight matrix on Brown matrix. Item #GS-2157: 2"x3"x1.75" tall, light Green Chrysoprase Cat with slight matrix on Brown matrix. Item #SC-BRDA-0120-X1: 1/8" x 5/8" long 14Kt. White Gold Cat Brooch with forty-six pavé set Round Diamonds of .30 cts. TW. Item #CB-3149: 14Kt. 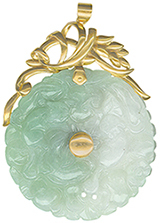 Yellow Gold pendant of 7.68 grams with 2" Jadeite donut with carved flowers, breadfruit and cats. Item #GS-2155: 1.5"x3.5"x1.75" tall gem quality Afghanistan Lapis Lazuli Cat with Matrix. Item #MD-1: Lot of twelve, 3-4" long, assorted natural colors, Mexican Onyx Cats. Item #MD-1: 3-4" long, assorted natural colors, Mexican Onyx Cat. SA-1: Approximately 1 1/4" long; assorted natural colors; 1 dozen. Item #SA-1: Approximately 1 1/4" long; assorted natural colors; 100 pieces. Item #SA-1: Approximately 1 1/4" long; assorted natural colors; 1,000 pieces. 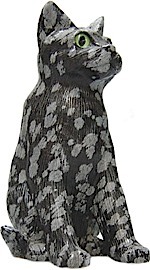 Item #GS-157: 2.5"x3.25"x5" tall, Black with White flakes, Snowflake Obsidian Cat. Item #SS-1374: Wooden Box with Sterling Silver Hinged Lid, Legs, & Cat with Yarn of 100.07 grams T.W.